How to Install Zend Framework on Ubuntu 16.04 LTS? Zend is a PHP based, Object-Oriented web framework. It is used to create dynamic web applications. It is designed and developed by Zend Technologies, and first released on March, 2006. In this tutorial, we will install and Zend Framework (ZF) in Ubuntu, before installing, make sure our system meets all the following prerequisites. Installing Zend is pretty easy, just use this single command and it will install an application template in our current directory. After installation, we can run/access it on the browser by using localhost/javatpoint/public URL that shows the output like below. 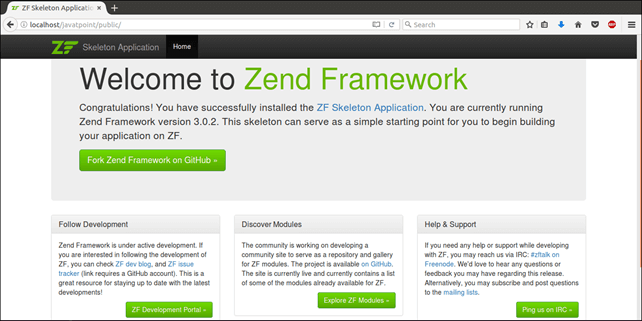 Well, Zend framework has been installed successfully, now, we can build application as per our requirement.